I used scoop.it SL Destinations to select a destination for my simploring tour Friday, February 23rd, and picked Château de Clagny. 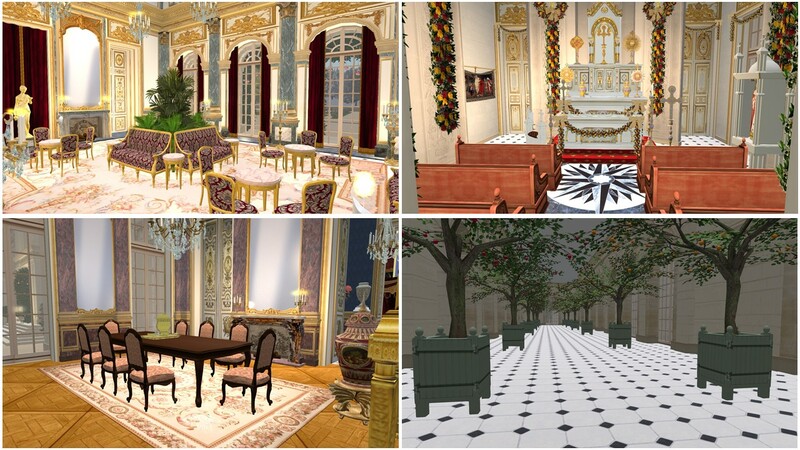 It is not the first château I visited within second life, I was at the Buckingham Palace (read here) in May 2016 and I visited Angel Manor (read here) in January 2015. While the Buckingham Palace still exsists up until today (and way longer), Angel Manor is a product of fantasy with many similarities to real châteaus. The Château de Clagny in Second Life is a reconstruction of a long lost building, demonstrating that we can visit and experience lost buildings and landmarks within virtual worlds. 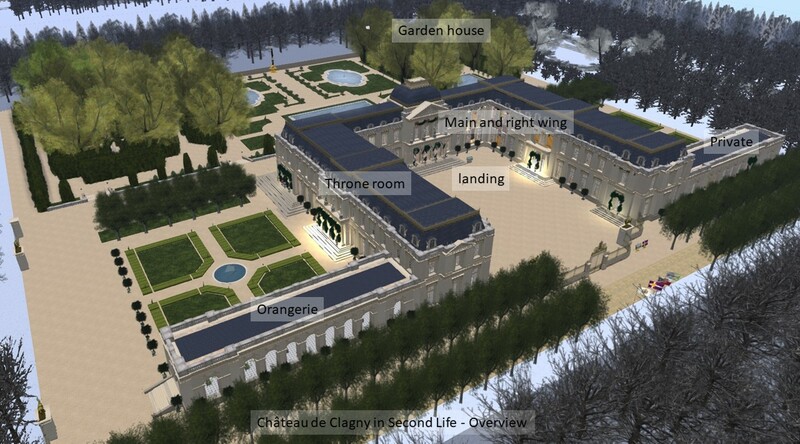 When you visit the Château de Clagny in Second Life you’ll land in the central court in front of the château. Right next to the main entrance you can grab a folder full with information and some engravings of the original château. The “French country house”, what an understatement (! 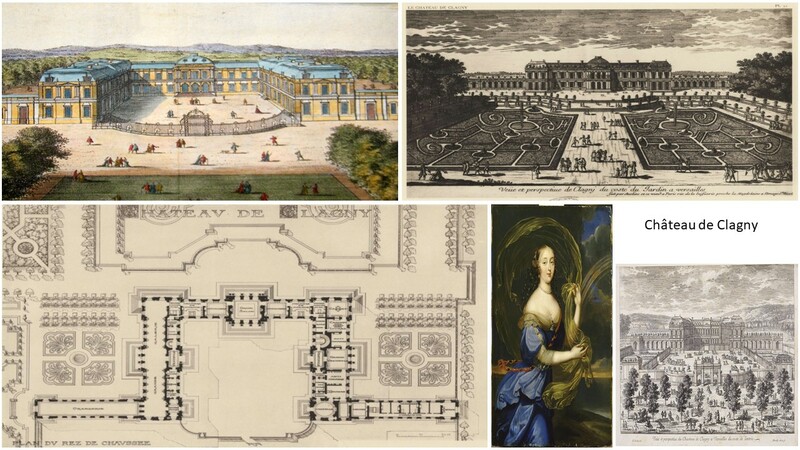 ), was built for Françoise Athénaïs de Rochechouart de Mortemart, Marquise of Montespan (5 October 1640 – 27 May 1707), better known as Madame de Montespan, who was the most celebrated maîtresse en titre of King Louis XIV of France, by whom she had seven children (from wikipedia). The architect was Jules Hardouin-Mansart (16 April 1646 – 11 May 1708), one of the most important European architects of the seventeenth century (from wikipedia). And now you can visit the Château de Clagny in Second Life! The reconstruction is quite impressive. This “French country house” is huge and very luxurious. You sense the wealth already from the outside, but the inside isn’t any less luxurious. I walked through many rooms and it was like visiting a palace in the physcial world. Really amazing. The main wing and the right wing are used for living, with dining rooms, bedrooms, a chapel, meeting rooms and smaller representation rooms. In the left wing there’s a huge throne room or ball room. Attached to the right wing are private rooms. The doors were locked, hence I didn’t walk in. Attached to the left wing is the organerie. The whole palace it surrounded by a large park. The Château de Clagny is owned by a group named LOS TEXANOS, founded by Pixapao Xeno de Bexar (Pixapao Xeno). I don’t know if he’s the creator of Château de Clagny, I can only assume it. Looking at his profile and at other profiles, I found when looking at the objects, I assume that the palace is also used for role playing, yet I didn’t find a clear hint nor did I find advertisements for events at the Château de Clagny. Some of the inventory of the palace is for sale, but there’s also no vendor or any disturbing advertisement for it. As a tourist, just enjoy the views and the luxury! I did enjoy my visit a lot and I couldn’t refrain to take a picture of myself as her majesty “Fetish Queen Diomita” in the throne room. My thank you goes to Pixapao Xeno and the LOS TEXANOS group for providing Château de Clagny to the public. I hope you can maintain the palace for many years to come.